At 07h30, Thursday, 04 April, NSRI Port Alfred duty crew were activated following reports of a small boat capsized in the Kowie River Mouth while exiting to go to sea with 2 crew onboard. The sea rescue craft Lotto Rescuer and Rescue 11 Alpha were launched and our sea rescue vehicle responded to East Beach. On arrival on the scene a Durban father (age 44) and his son (age 12) were found safe ashore on East Beach and not injured and their 4.6 meter boat was washing ashore. 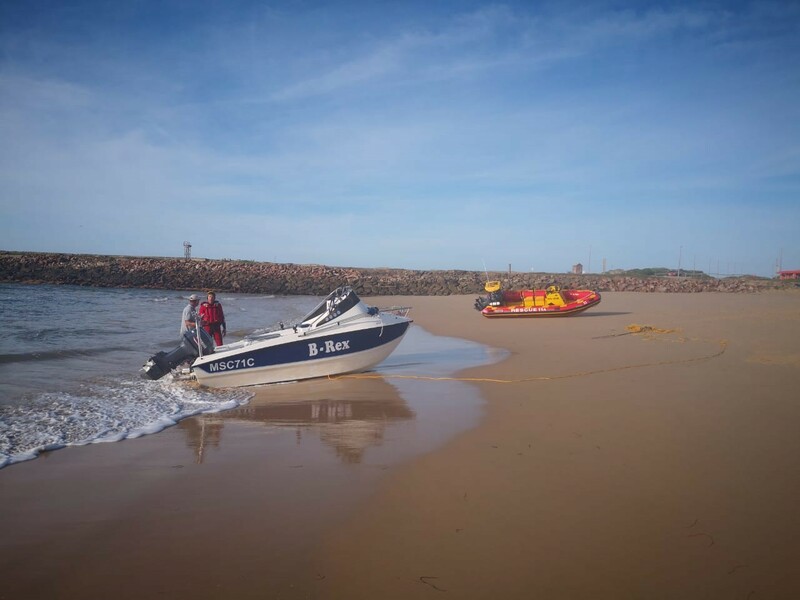 NSRI assisted to recover their boat and no further assistance was required. At, 14h00, Wednesday, 03 April, NSRI Lamberts Bay duty crew were activated following a request for assistance from 2 fishermen reporting to be adrift at sea off-shore of Lamberts Bay following fuel starvation to their open sea craft. The sea rescue craft Spirit of St Francis was launched and following a search we found the 2 fishermen safe 6 nautical miles off-shore. A towline was rigged and they were towed to Lamberts Bay harbour without incident. At 15h38, Tuesday, 02 April, NSRI Bakoven duty crew were activated to investigate reports of 2 people suspected to be swept off rocks at Barley Bay, Bakoven. NSRI Bakoven rescue swimmers, City of Cape Town (CoCT) lifeguards from Camps Bay responded and Cape Town Fire and Rescue Services activated a Dive Unit and a fire tender. WC Government Health EMS, the EMS/AMS Skymed rescue helicopter, Community Medics, ER24 ambulance services and CoCT Law Enforcement Marine Unit were placed on alert. On arrival on the scene eye-witnesses reported seeing 2 or 3 young men on rocks appearing to be swept off rocks and during a search and investigations we found the 3 males at their house at Bakoven and they were safe and reporting that they had swum ashore and were not in any difficulty. It was confirmed to be a false alarm with good intentions and determined that the eye witness had seen them go into the water but had not seen them come ashore. The eye witness was commended for calling NSRI after being unsure of the fate of the 3 swimmers.